After receiving a lot of criticism that put her name to shame, she submitted a letter last June 18, 2012 to the office of Committee on Rules headed by Cong. Neptali Gonzales II, indicating that she is withdrawing sponsorship from the filed House Bill. But her will to get the peoples attention did not stop from there. There she is with a new program obviously to clear her name and reputation as a politician who is obviously aiming for a higher position on the next coming election. After the failed attempt to "legally rob" money from the OFW's, she is now offering free passport. This girl never stops to amazed the Filipino people. From Anti OFW to "I Love OFW" drama. By the way ,do politicians really need to put their big face to every banner of their projects posted on every public places. It's always what gets them vote and not what they believe in anyway for politician. Even how they change alliance or dispositions its all for the convenience of being elected. Reading about this politician makes me shake my head in disbelief. As always when confronted with how politician seem to get away with their behaviour, whether it's in the Philippines or elsewhere in the world, one can only wish that people, who voted for them will be more discerning in the next voting period. Well, Ms. Tess, you can find her face in every corner of Espana Blvd. and what can we expect election is nearing dadami na naman ang EPAL. I think this is an immature and early campaign for the next election. I am not familiar who she is, and who will provide funds for this program, will it be coming from her own pork barrel? yah! she just needs some attention. Pitiful! OFW sector is now being exploited by these politicians since they do command a high number of votes from around the world. feels like she's an endorser for skin care. nice program though. Government Officials naman kasi should think first before passing bills, di yung masabi lang na may nai-pass eh! Parang this one is into tourism noh, maybe she wants to be the chairman of DOT someday? Hmm.. I've seen that issue on Facebook and all around the web though i am not a worker here in singapore I'm still concern about my friends who's OFW that's facing a lot of credits and debt in philippines or their agencies. so this better girl better get the job done correctly! haha! Hopefully she will do her best as a politician. own way of getting NOTICED. it's something else. Mabuti na lng, MAGANDA sya. Trisha Bonoan-David should resign as a public official. She is a disgrace to the House of representative. I think she should just join show business. She didn't make it on her first attempt now she is reviving her name for free passports. Whoa! And yes, I agree why do they really need to put their faces on everything, anywhere? She's a very busy politician. I see her poster all over Manila. Well done. A typical politician. Always trying to win the heart and vote of her people no matter what. Failed attempt though. There is a saying: "You can cheat people sometime. But you can't cheat them all the time!" Hope you get what I mean? She's indeed a politician! another witless wonder in congress! oh well. matagal na pong project ni cong. david ang libreng pa.passport. kaya i thnk di to strategy o PR para mahugas kamay o paglinis pangalan! 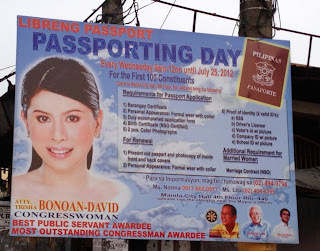 The Libre Passport program has been an annual event for the Congresswoman for years already. This is NOT a response to the misunderstanding resulting from bill 6195. As for her picture, she uses that and the cloud theme as a way for people to quickly notice and identify the messages she has for her constituents. It is an attempt to bring attention to the PROGRAMS, not to her personally. One comment here says she should simply "join showbiz." She is not doing this for fame, she is truly trying her best to help the people of Sampaloc. Joining showbiz would not allow her to be as helpful to Sampaloc through her many, MANY programs, like Libre Passports, College Scholarships, Training Pangkabuhayan, and so on. And without tarpaulin announcements, how would the people of Sampaloc know about the programs available to them? Radio & TV are far too expensive, and Facebook, although popular, does not reach very many of the people she is trying to find. The tarpaulins are very cost effective and get the word out well. Finally, although I agree with OFW's that it is difficult to pay so many fees up front, before they begin earning from their overseas jobs, I do understand why she was behind the bill, particularly after my brother and so many other Filipinos were trapped during the Libya uprising last year. $50 (just over P2,000) is cheap for emergency help in situations like that. In my opinion, OFW's SHOULD pay for that - they would be the only beneficiary's of the program. But I would like to see that fee due only after they have been earning at their new job, say for about 60 days or so.